I’m sure there are many coffee shops that still make them, but I hadn’t had a chai latte in years. The memories of that first chai latte are still fresh in my mind (many, many years later! 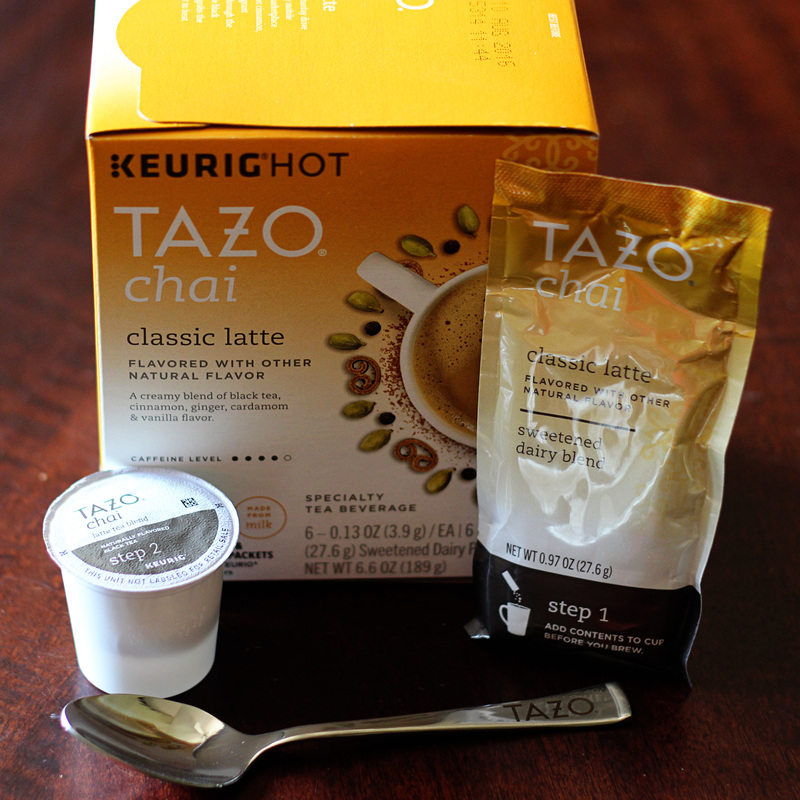 ), so I was absolutely delighted to learn I could make one at home with my Keurig® and the new TAZO® Chai Latte K-Cup® Pods! Have you ever tried chai? Chai is a black tea blend known for its combination of sweet and spicy tones that originated in India. Mix that with the creaminess of milk and you have a drink that satisfies all your tastebuds! STEP 1: Pour the powdered milk packet into your favorite mug. You can choose from classic or vanilla caramel. Both are delicious! 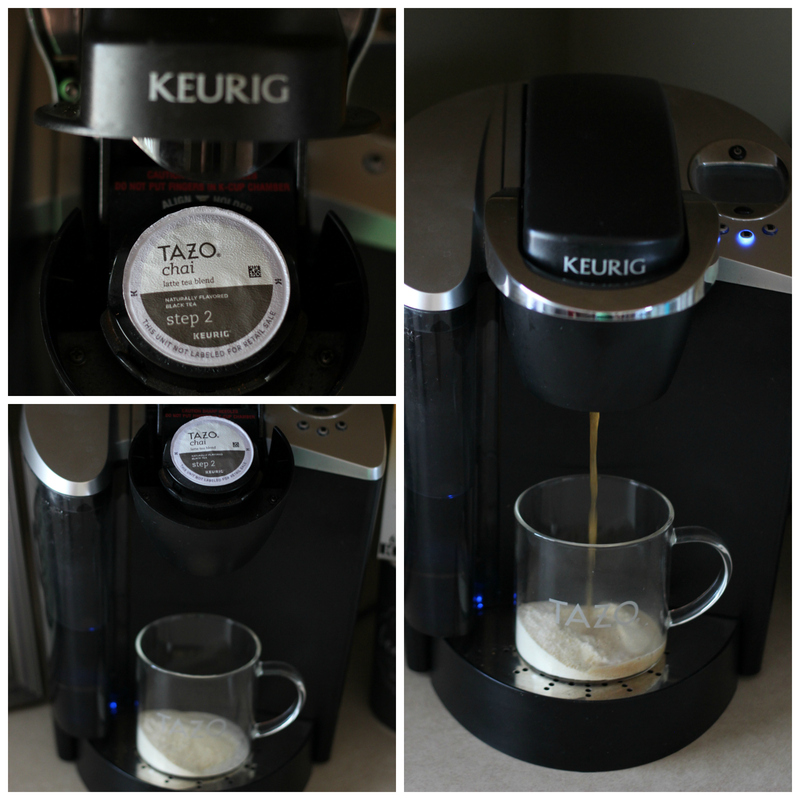 STEP 2: Place the mug under your Keurig® and brew theTAZO® Chai Latte K-Cup® pod into your mug. STEP 3: (Ok, yes, there is a third step) Stir well and enjoy! 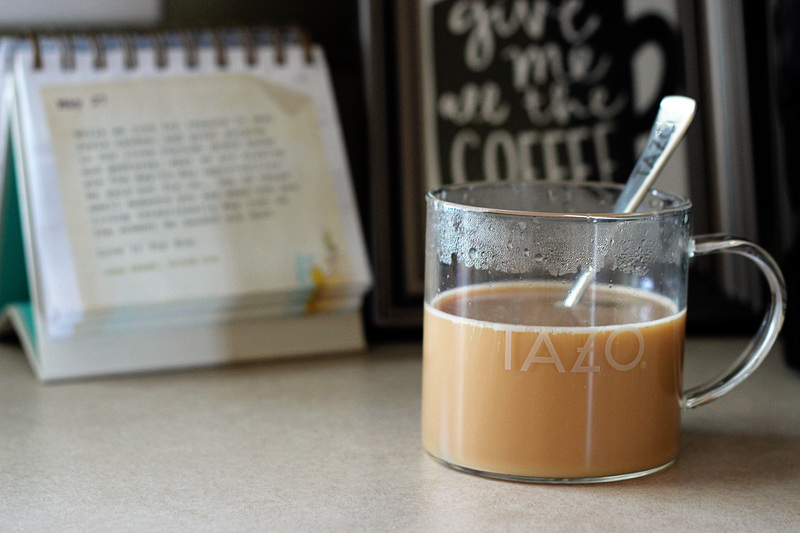 I know you will enjoy the creamy, spicy, sweet taste of this made-at-home chai latte! It may be the middle of summer, but with the first sip I was thinking “Christmas in a cup” all over again. There were lots of happy sighs coming from this mama! 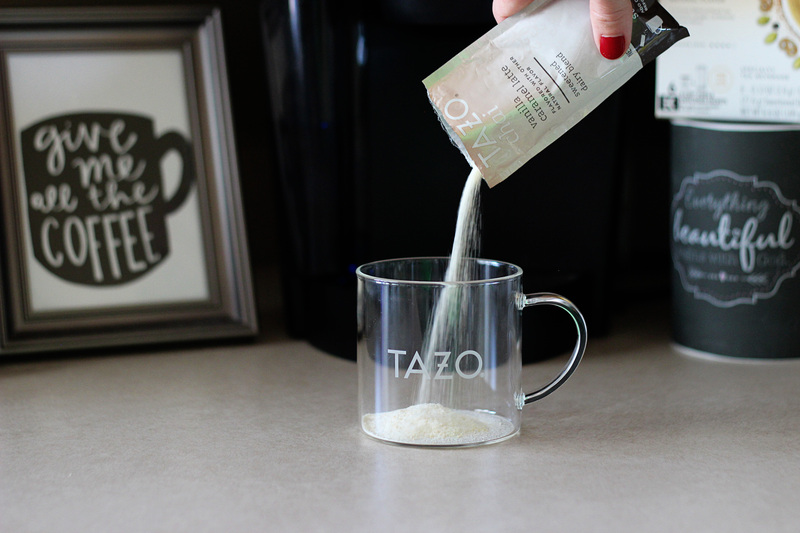 Adding to your wonderful chai latte experience,TAZO® has partnered with New York Times Bestselling author and host Padma Lakshmi to bring us some amazing recipes to pair with this delicious drink! Padma grew up with the flavors of tea and chai, so her recipes come from a lifetime of experience and memories and they are fabulous. The cinnamon tea cookies are my pick for an afternoon chai latte date with girlfriends! 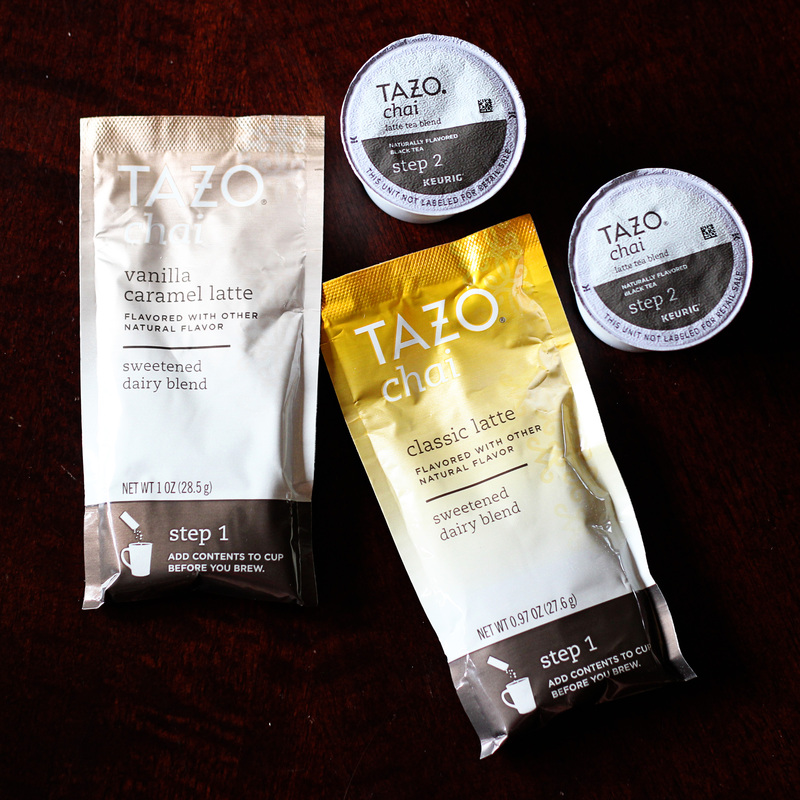 TAZO® Chai Latte K-Cup® pods are popping up in stores now and you can find out what stores are carrying them by clicking here! Grab some and enjoy your own sweet, spicy, creamy, wonderful chai latte in the comfort of your home! Which of Padma’s recipes would you love to try with your chai latte? These look great! I am a Kcup addict. <3 I love that you include recipes! KCups = fast coffee = one of the best inventions ever.